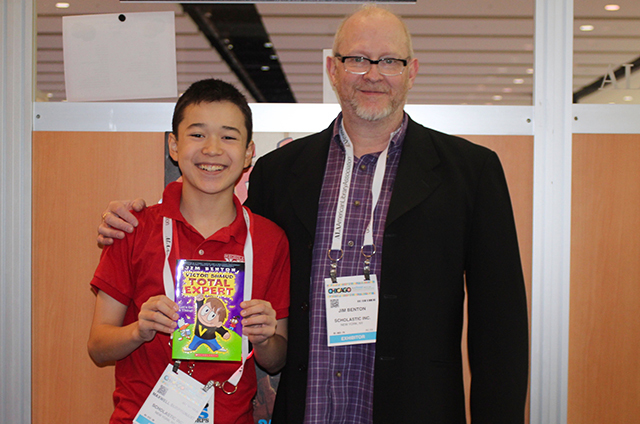 Making People Laugh | Kid Reporters' Notebook | Scholastic Inc.
Click below to see clips from Maxwell’s interview with Jim Benton. Benton grew up in Michigan, where he currently lives with his wife and two children. After studying fine arts at Western Michigan University, Benton drew illustrations and cartoons for magazines and newspapers. His books include the Dear Dumb Diary series (Scholastic), the Franny K. Stein, Mad Scientist series (Simon & Schuster Books for Young Readers), and Man, I hate cursive, a collection of comics (Andrews McMeel Publishing). How does it feel to be nominated for the 2017 Eisner Award for Man, I hate cursive? Will Eisner, for whom the award is named, created The Spirit [a comic strip about a fictional masked crimefighter] and lots of other really great comics. Eisner is a huge hero of mine, so just being nominated for something with his name on it is a pretty big deal for me. How do you come up with ideas for the Dear Dumb Diary series? Do you keep a diary? No, I don’t. I do sketch every day. I just sit down and start writing. If I know that something funny is supposed to be in a certain place, but I can’t think of something funny, I’ll just write, “Something funny happens here.” When I come back, I can put a joke in. I try not to lose momentum. I just sit down, and the ideas come. What is the most exciting part about being a children's book author and illustrator? The most exciting part is when you get emails or, sometimes, letters from kids talking about the stories, talking about how much they liked them, and how funny they thought they were. I just had a tweet the other day. A teacher read Victor Shmud to his class, and he said that the kids were laughing so hard they were crying. When I was a kid, I read a lot of comic books. I read Batman. I read Mad magazine. I read Pippi Longstocking. As I got a little bit older, I read things like The Hitchhiker’s Guide to the Galaxy and other science-fiction books. I’ve always read an equal amount of books that they would call good books and trash. I like them both. Do you have any tips for kids who may be interested in a career as a writer or an illustrator? If you look around at a library or a bookstore, none of the books there are first drafts. Every book has been rewritten. When you write the first draft, you know that you’re going to go back and fix it, so you don’t have to worry about it that much. It’s important to know that you’re going to rewrite the piece.